Eras Natural Sciences' Wound Honey is a wound care topical product which has natural, powerful anti-bacterial properties. 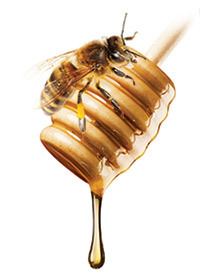 Wound Honey aids in healing, helps to soothe painful wounds, and protects against infections. 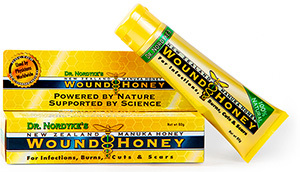 The key ingredient to this powerful wound care topical is Active Manuka Honey, imported directly from New Zealand. Active Manuka Honey is pure, natural, unpasteurized, organic honey that is collected from the Tea Tree Bush (Leptospermum). Active Manuka Honey is clinically proven to have antibacterial properties, including activity against MRSA. Active Manuka decreases infections, reduces malodor, soothes pain, and protects against additional infections. Wound Honey uses the power of Active Manuka Honey and combines it with Aloe Vera and Panthenol (a non-irritating form of Vitamin B) to increase the soothing properties, assist in cell regeneration, and speed up healing. To learn more about our product, please refer to How It Works. The key ingredient to this powerful wound care topical is Active Manuka Honey, a pure, natural, unpasteurized and organic honey.